Titan Sepp (bottom) and Gloa Sepp (bottom) are closely related. 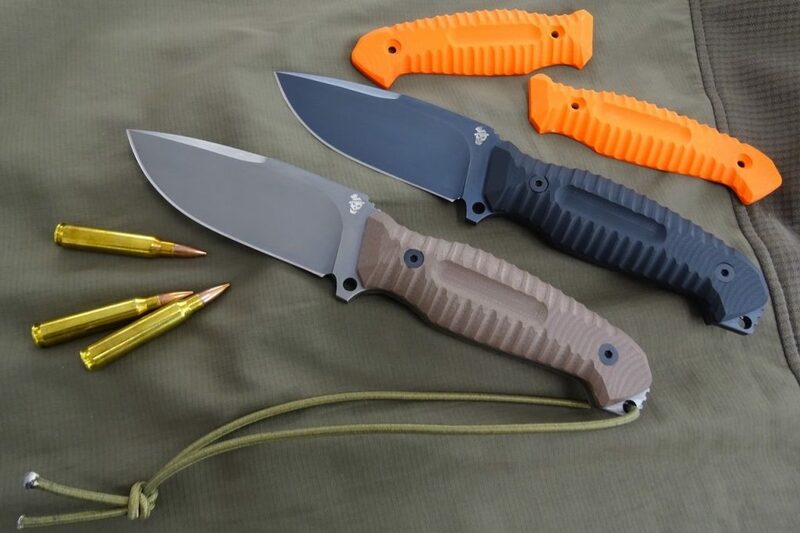 The first is a large military folder, while the second is more suitable to the civilian, also concealed. One of the first drawings of what would become the Titan Sepp. Matthias Hainich gave me precise specifications so that it would be hard to draw something different. Viper gave careful attention to the heat treatment. Each blade is vacuum tempered and subjected to cryogenic treatment, for a final hardness of 58/60 HRC. 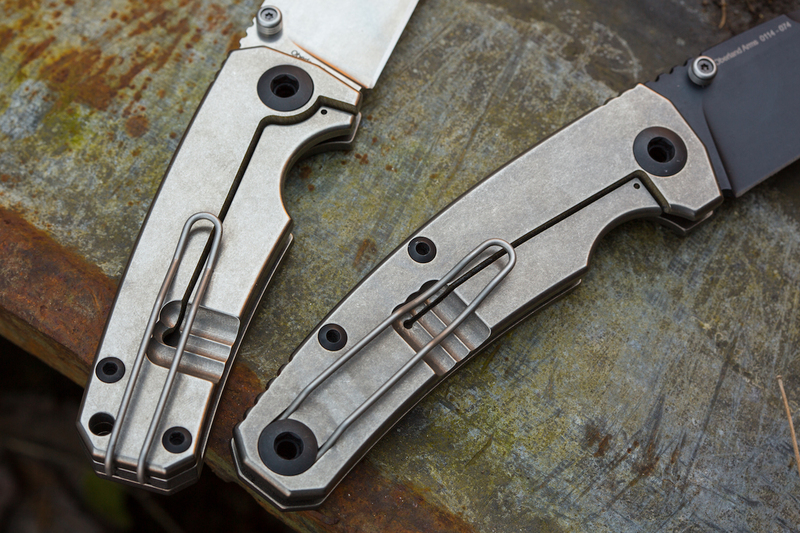 The handles are made of titanium, with stonewashed finish. The locking system is a framelock, and the length of the elastic lamina is identical on both models. To get the right elasticity, at the base of the spring there are three millings. One of the Gloa Sepp drawings. To achieve a reduction of the total length of four centimeters, it has been necessary a lot of effort. The most obvious difference is the disappearance of large rear screw, too cumbersome, replaced by a titanium rear spacer. 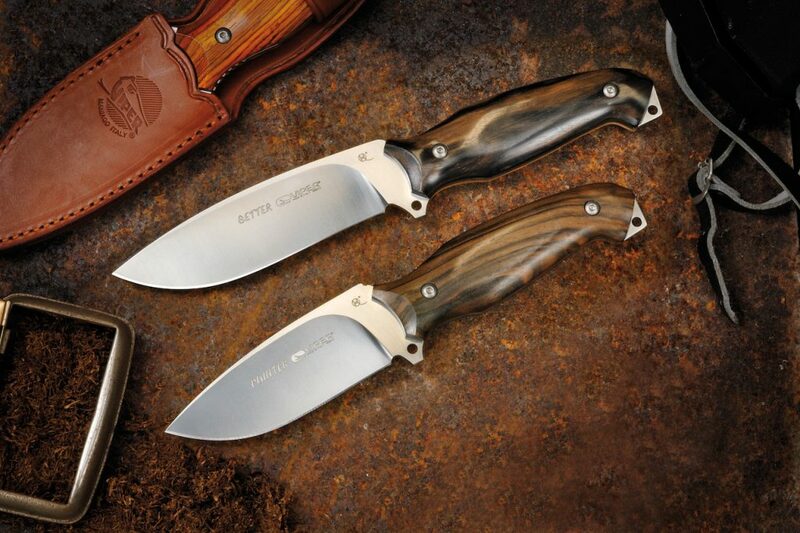 When closed, both knives have regular dimensions, and are devoid of sharp protrusions. Scales are flat, without any texture, so you do not ruin your clothes. 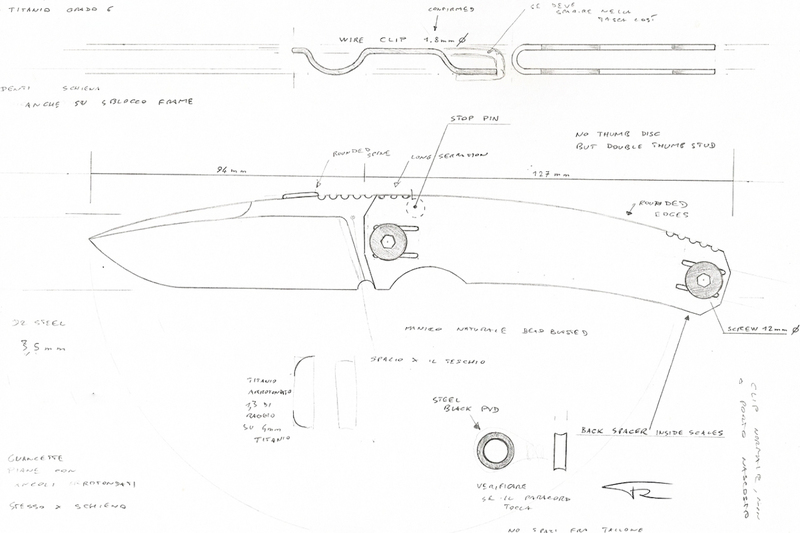 Oberland Arms folder are produced in a few hundred pieces. 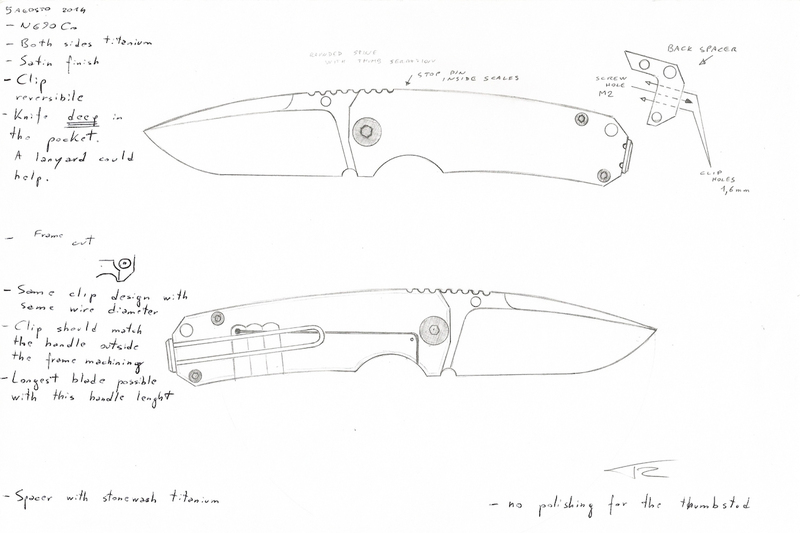 Each unit has its serial number, which on Titan Sepp is engraved on the left side of the blade, while on Gloa Sepp is located on the rear spacer. Both knives sport a wire clip. In the case of Gloa Sepp (left) is fixed to the rear spacer, and the knife disappears in your pocket. On Titan Sepp it is blocked by the rear screw, and a small handle portion protrudes. 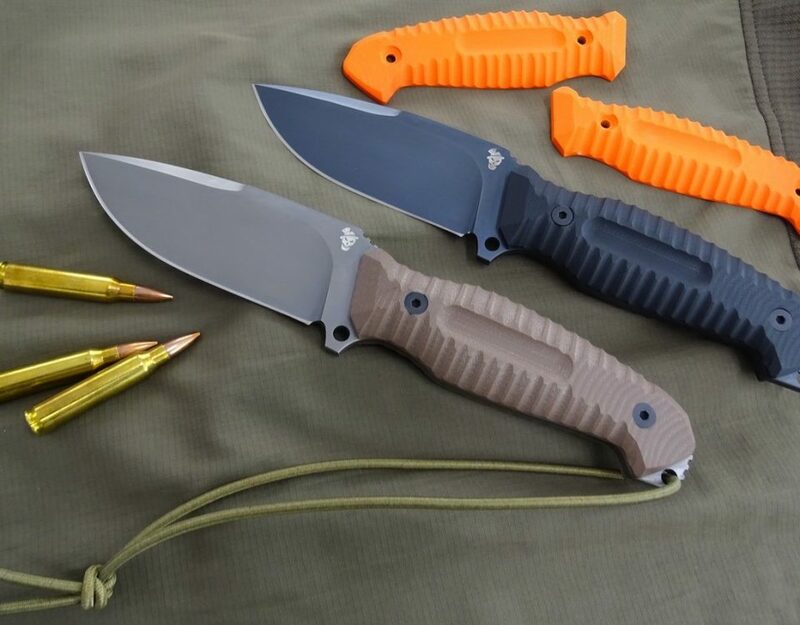 There are many knives that bear the mark of important companies in the arms sector, but unfortunately many are from the economy segment. Oberland Arms wanted high quality, and as often happens that meant two things: Italian design and production. My first collaboration with Oberland (Black & Desert Sepp Sepp) was quite simple to accomplish, since I had to modify a pre-existing design. This time it was different: it was necessary to make a new design, a folding one. Matthias Hainich, CEO, gave me a list of those who should have been the main features of the new project. They were so detailed that when I presented the first draft, I warned him that I would hardly managed to draw something different, respecting indications so precise. Fortunately, that proposal pleased him, and after some refinements, was ready for production. Oberland Arms produces high-end AR-15 rifles, mainly for special police units and special forces. 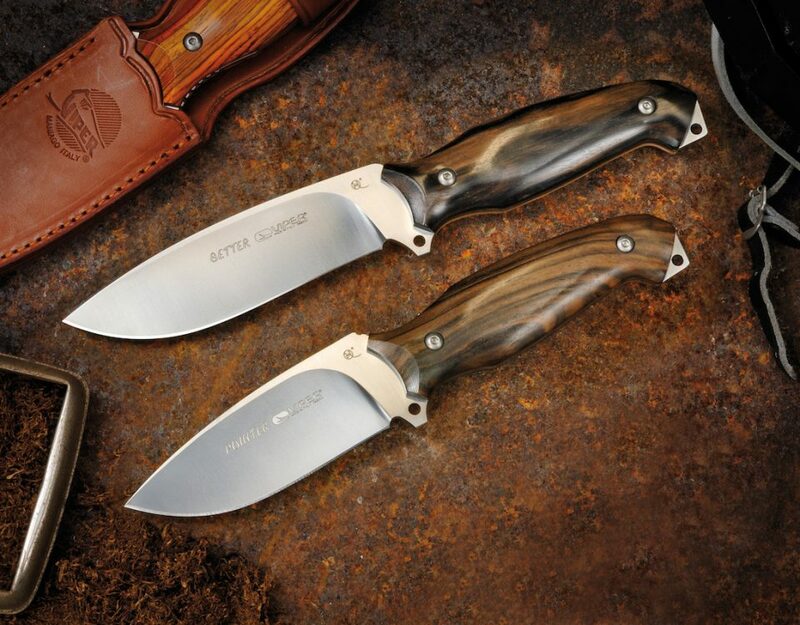 His knives are designed for the same customers, and therefore are not subject to fashions or market trends, but have to be reliable, practical and solid. For these reasons, the design is essential, without aesthetic tinsels and designed to deliver the highest performances in real use. 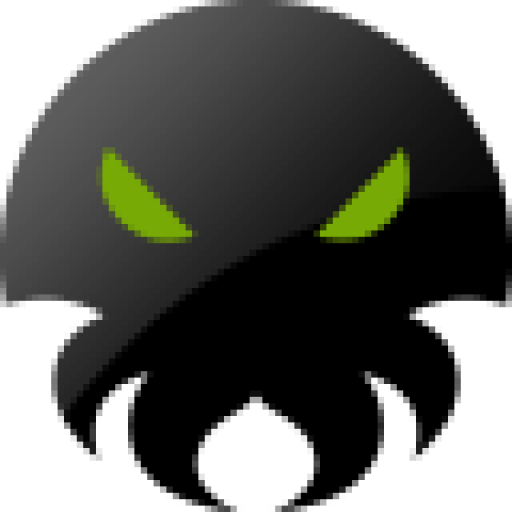 Although Titan and Gloa Sepp Sepp has been released in two different moments, I decided to keep them together on this page, since they are closely related. 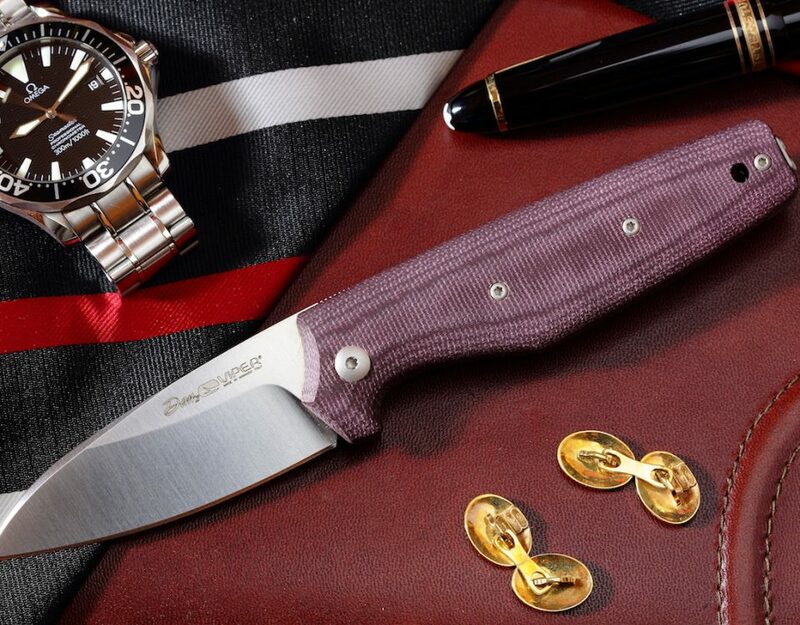 The Gloa Sepp was born with the idea of ​​creating a folder more suited to EDC compared to the original one, expecially concealed carry, maintaining as much as possible the robustness and practicality of the elder brother: saving four centimeters on the total length of the open knife, demanded careful work. Titan Sepp blade is made of steel AISI D2 tool steel, hardened in a controlled atmosphere and subjected to cryogenic treatment, up to 58/60 HRC. The Gloa Sepp one is made of Böhler N690Co. The design, length apart, is the same: a drop point with high bevels, related to that of the previous Black and Desert Sepp. A partial swedge increases the penetration capability and gives a more aggressive design. Both are three millimeters and a half thick, enough to ensure the robustness during real use, without reaching certain excesses such as to compromise the cutting qualities. The Titan Sepp was produced only with matte black PVD coated blade, with the dual function of eliminating the reflections and protect the D2 from oxidation. 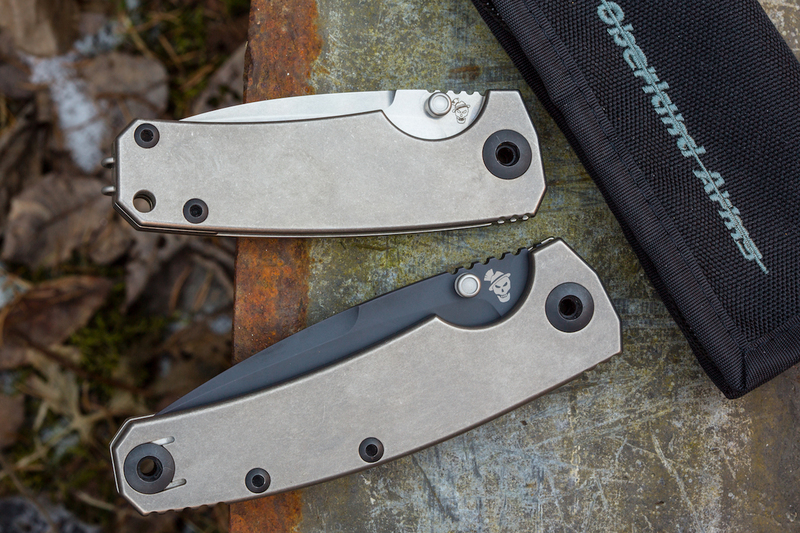 The smallest model, having a steel more resistant to oxidation, has stonewashed finish. 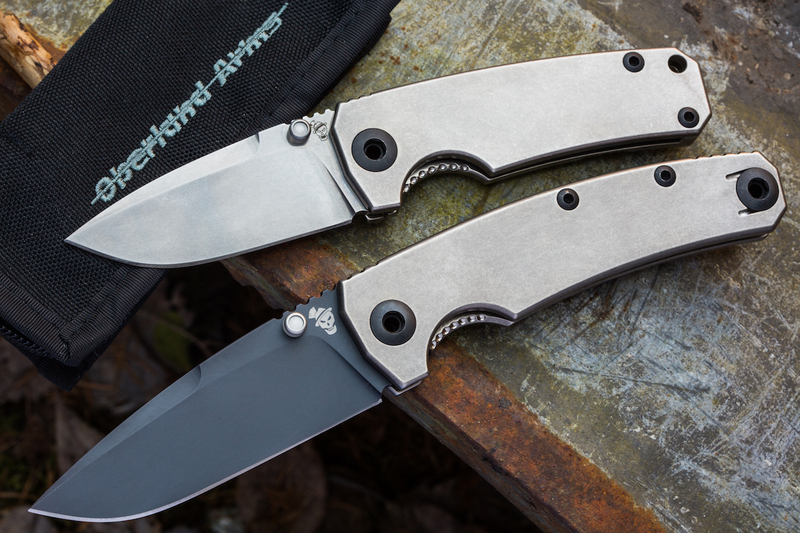 The handle of Sepp folders is made of two halves of Titanium Ti6Al4V, four millimeters thick, with stonewashed matte finish. On the largest one, the two panels are separated by two hourglass spacers and a larger one, crossed by a large screw identical to the one used as pivot. 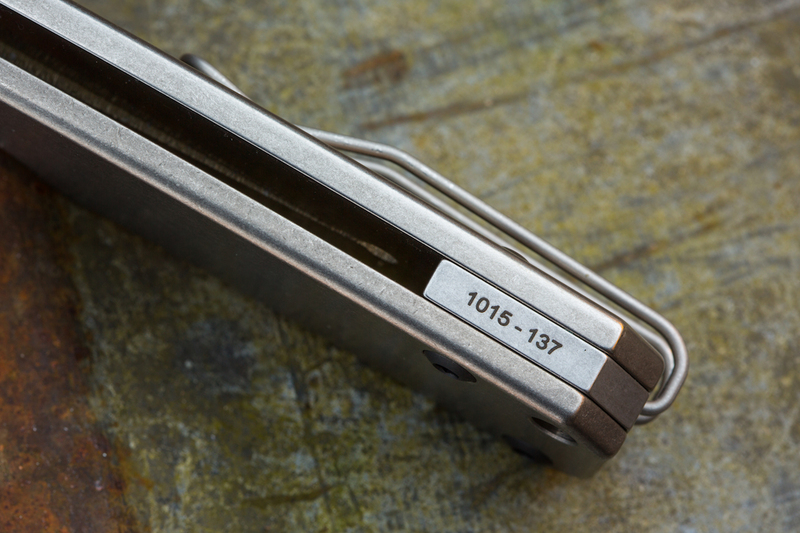 The smallest folder has a titanium rear spacer, less cumbersome, where the serial number is engraved. The handle of the Titan Sepp is designed to be suitable for large or gloved hands. The other is more compact, but still big enough for a normal-sized hand. The sides of the handle hasn’t any texture, so as not to ruin clothes. Therefore, to ensure a firm and secure grip I only worked on ergonomics, drawing a index groove, a generous lower guard, and giving the whole handle a slight curvature. The thumb rests on the knurls, both in straight or reverse grip. 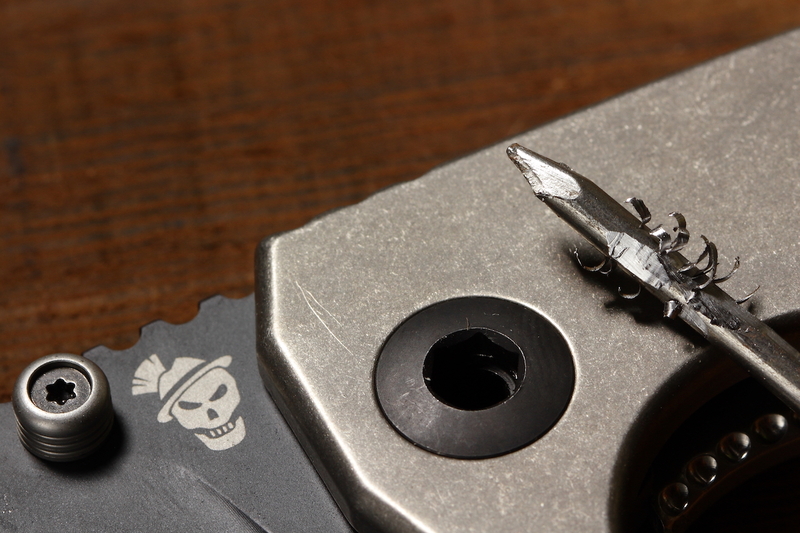 Once opened, the blade rests on the internal stop pin, and is locked by a framelock, with rounded teeth to facilitate the release. To get the right elasticity, the spring has three millings at its base. The length of the spring is identical on both models, which thus are closed with the same ease. 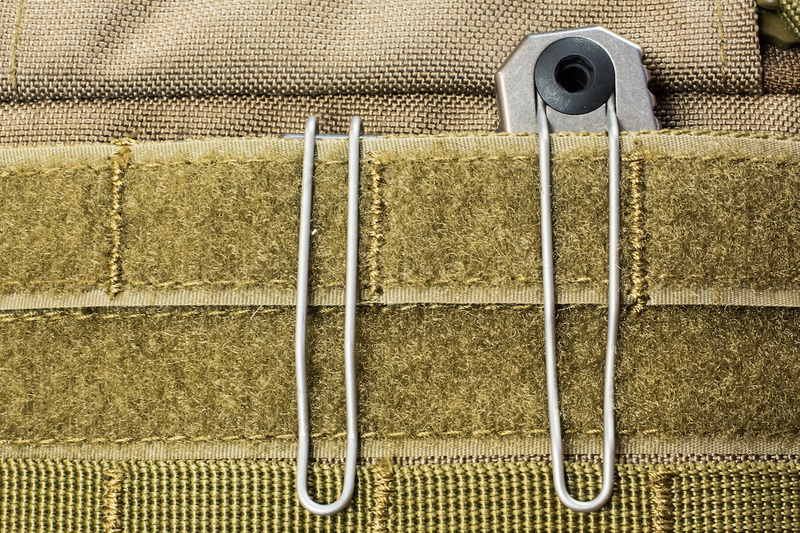 Both folders have a sturdy wire clip. On Titan Sepp it is fixed to the rear screw and leaves protrude a handle portion from the pocket, speeding up the extraction. On Gloa Sepp the clip is inserted into the rear spacer, and makes it disappear completely in the pocket. On both it is possible to attach a lanyard to speed the extraction. Each Sepp is delivered in a black nylon pouch with the Oberland Arms titanium gray logo, closed by a zipper. To comply with the laws of some countries, including Germany, that penalize folder with lock and one hand opening, they are delivered with a thumb stud in a plastic bag: the owner decides if he wants to use it. 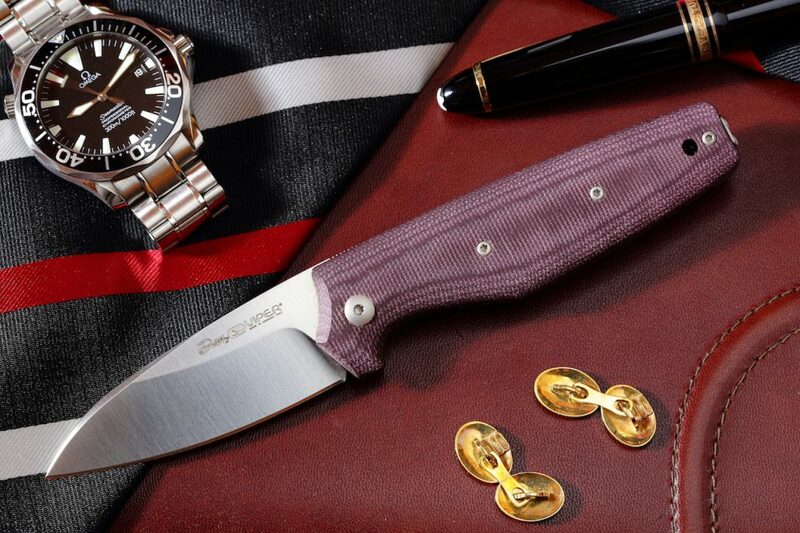 For both knives price is 195 Euros, directly from the manufacturer’s website. At the time of writing this, the Titan Sepp has run out of stock, and the Gloa Sepp is ending. It’s easy to predict a good quotation for these folders: they were produced in a few hundred pieces, and in many countries they arrived in just a few units, which makes them even more rare.